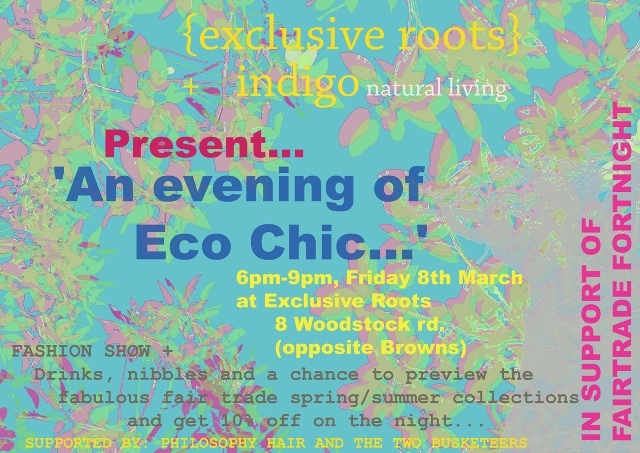 For Fairtrade Fortnight join Exclusive Roots and Indigo this Friday for an evening of Eco-Chic. Fashion Show, Drinks and Nibbles and a chance to preview new spring and summer collections. Plus get 10% off sales on the night. This entry was posted on Wednesday, March 6th, 2013 at 3:56 pm and is filed under Uncategorized. You can follow any responses to this entry through the RSS 2.0 feed. You can leave a response, or trackback from your own site.